Typically, passivation is performed with a nitric acid bath from 20 to 50% by volume. Temperatures range from ambient to 160 degrees F. Immersion times can be as long as two hours and even include the addition of a chromate salt. Nitric acid is by far the most accepted means by which passivation is performed. Recently, however, there has been an increase in the amount of industries that have successfully implemented citric acid into their passivation procedures. Citric acid is an organic acid unlike nitric which is a mineral acid. It reacts with the iron much better than nitric and does not attack elements in stainless steel alloy which nitric acid does. And citric acid, overall, is a less harmful chemical than nitric acid. Nitric acid raises problems with environmental disposal, health and safety, environmental pollution, increased environmental liability and regulation, and overall complexity to utilize it. Citric acid on the other hand is derived from oranges, utilized in food and beverage products, is acceptable in some instances to go right to drain, depending upon contaminants and local environmental regulations, and much more friendlier when it comes to worker health and safety. Even the process aspect of citric acid passivation is easier. Stainless steel must be cleaned prior to any passivation procedure. All surfaces contaminated with oil, grease, chips, grinding dust, lapping compound, buffing compound, coolant, and/or swarf must be removed. 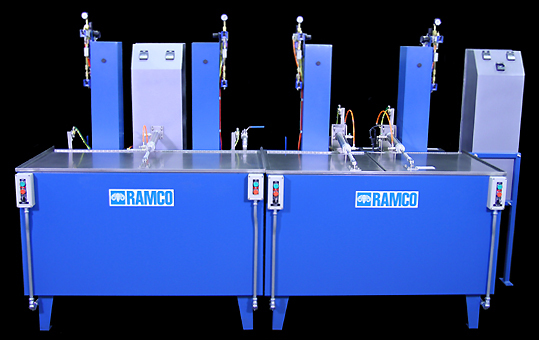 For more information on this and other passivation system call our factory at 800-553-3650. For more information on citric acid passivation chemicals and processing go to Stellar Solutions. 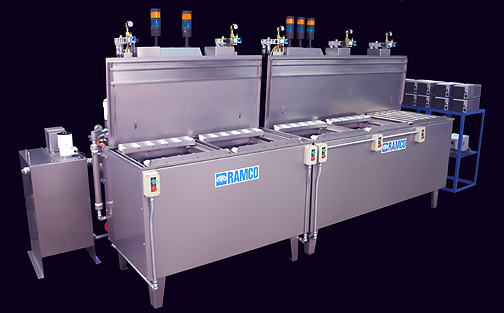 Above are three different citric acid passivation systems designed and built at RAMCO. The lines were developed based on the batch load size/weight, cleanliness level of the parts prior to passivation, and the required throughput per hour.